Ca. 450-200 BC (Gladiatorial, ca. 120-30 BC) Originally worn by Etruscan and Samnite warriors, this style was later adopted by the Samnite class of Roman Gladiators. 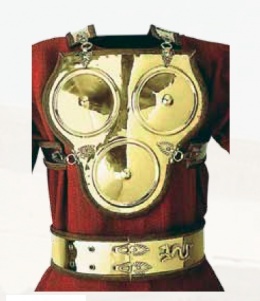 The accompaning brass belt was consider a sign of a warrior in Central Italy.